Monoethanolamine (MEA) is used in the production of detergents, pharmaceuticals polishes, corrosion inhibitors or as an chemical intermediate – a well known example is the reaction of MEA with ammonia to gives ethylenediamine, a precursor of the commonly used EDTA. MEA (C2H7NO) is produced when ethylene oxide (C2H4O) is reacting with aqueous ammonia (NH3). This reaction also produces the co-products diethanolamine and triethanolamine (see figure). The relative production volume of the 3 co-products can be controlled by changing the proportion of the reactants in the solution, which means the amounts of the co-products can be varied independently, and all products are therefore determining products, independently of each other. Therefore we can describe each production separately for this combined production based on the stoichiometric requirements of each product, with the hydroxyl (OH) being the limiting functional group. To make 1kg MEA we need 0,279kg ammonia and 0,721kg Ethylene oxide. To identify these masses we use the standard formula m=n*M, where m=mass (kg), n=amount of substance (mol) and M=Molar mass (kg/mol). Figure. 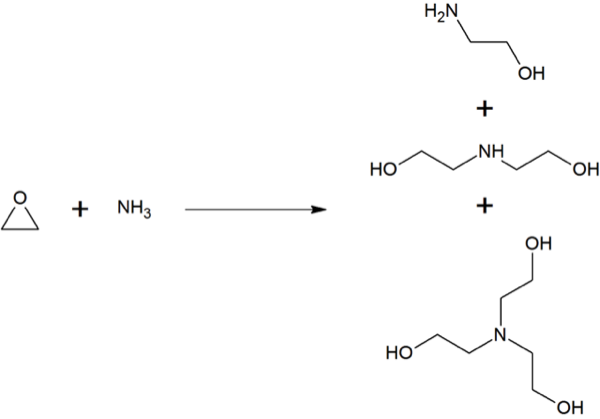 Reaction of ethylene oxide (C2H4O) with Amonium (NH3) to form the three ethanolamines. Rifleman 82, Wikimedia Commons (accessed 16. March 2015). For this well-known example we used on-line sources – Wikipedia and Wikimedia. Data on this process is available upon licensing from the ecoinvent database.